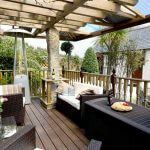 Meadowview Cottage provides a 5 star Gold Cornwall luxury self catering cottage holiday home in North Cornwall. Below is a copy of the Energy Performance Certificate for your peace of mind that you will be renting a cosy country cottage. Not all holiday homes have the level of insulation that Debbie and Roger have invested in this stunning luxury holiday accommodation. This helps the structure of the property retain warmth and provide a living environment that will make your stay at Meadowview Cottage a luxury and comfortable experience. In addition to ensuring Meadowview Cottage is well insulated, Debbie and Roger appreciate how important it is for their guests to instantly feel comfortable in their chosen luxury holiday cottage. For this reason the cottage is heated throughout all year round. During your stay, the radiators throughout this luxury 5 star gold cottage and your hot water supply, is heated by an energy efficient oil-fired boiler. In addition there is an electric wood burning stove to provide secondary heating or use it just to create a lovely snug ambiance on a cold chilly night. It is this level of care and attention that Debbie and Roger continually invest in providing the best Cornwall luxury self catering holiday cottage experience for their guests, that they have been awarded a 5 star Gold rating by the tourist board and the 2016 VisitEngland Rose award.